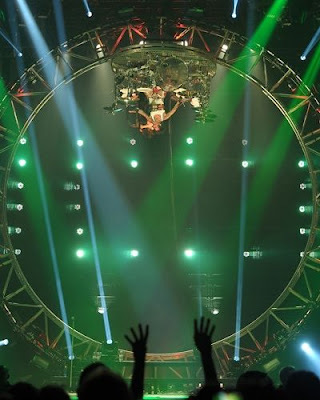 Motley Crue retired Tommy Lee’s rollercoaster drum set following the band’s show in Atlantic City on Saturday, the last of their current tour. “Bye Bye Rollercoaster of Love!” tweeted Lee. The Crue introduced Lee’s set during their 2011 tour, and after so many shows, they felt the need to give it a proper send-off. The Crue have a few festival shows this summer to play before they return to Las Vegas this fall for a second residency. An “Evening In Hell” sees the group back at The Joint at Hard Rock Hotel & Casino for an exclusive 12-show run from September 18 through October 6.